Mayor de Blasio was driven to his gym in a Chevy Suburban like this one. The de Blasio administration is apparently not ready to emulate a radical plan announced Tuesday by the City of London that would ban cars from a huge swath of the city center and reduce speed limits to 15 miles per hour. City Hall did not return an email. That’s too bad because the London plan — which aims to usher in a “world-class” street scene in the financial core of the sprawling metropolis — could be a model for New York. 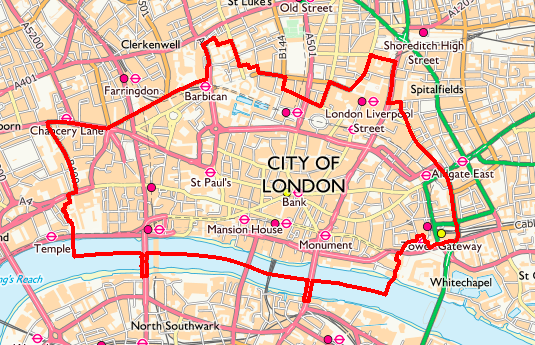 Under the proposal, all cars, vans, taxis, buses and even bicycles would be banned from “pedestrian priority” zones that would comprise at least half of the roads in the so-called “Square Mile” of the City of London. The plan also includes a “core cycling network” of wider protected bike lanes. “This is an ambitious piece of work,” Chris Hayward, chairman of the planning and transportation committee for the City of London Corporation said in a statement, adding that the “radical” proposal is aimed at “future-proofing” the city. “With over 480,000 workers commuting into the Square Mile on a day-to-day basis, these are some of the busiest streets in London and we need to be open for business,” he added, defying some fact-averse New Yorkers who believe that cycling- and pedestrian-centric areas undermine economic activity. Bike advocates hailed the plan, despite its ban on bicycles in some areas. The London plan comes just one day after the United Nations’ Intergovernmental Panel on Climate Change issued a damning report suggesting that cataclysmic, civilization-destroying climate change can only be avoided with a radical restructuring of global society. Almost at the instant the London plan was announced, Streetsblog spotted Mayor de Blasio’s Chevy Suburban SUV parked (legally!) outside the Prospect Park Y while Hizzoner was inside doing one of his several-times-per-week workouts. So Streetsblog did some math. The mayor has access to smaller cars and even hybrid SUVs, but this Chevy Suburban is a horrendous gas guzzler. According to specs published by Car and Driver, this 7,300-pound behemoth puts 9.2 tons of carbon into the air for every 15,000 miles, or roughly 1.1 tons of carbon to take the mayor 12.2 miles from Gracie Mansion to Park Slope three times per week for a year. How much is 1.1 tons of carbon? Well, 1 million tons of carbon is equivalent of the pollution generated by the electrical needs of 128,000 U.S. homes in a year. So the mayor’s 1.1 tons of carbon is (sound effect of keys clicking on an old adding machine) the equivalent of the pollution emitted by one typical American house for 51 days. Streetsblog asked City Hall if the mayor has any intention of not doing that anymore. “No plan to,” said mayoral spokesman Eric Phillips. Speaker is committed to reducing congestion and safer streets, which he believes can be achieved through congestion pricing. He applauds London’s efforts and will monitor their progress closely. De Blasio to future generations (and this one): Drop Dead. SupermanMayor Rudy flew over the streets with his magic super powers. Can we please stop addressing fossil fuel use solely in global warming terms? That’s why the movement to decrease such use has been an abysmal failure. I would have framed the debate on that solely on the costs of foreign oil wars, the resulting terrorism, and the millions who prematurely die each year due to the effects of pollution. Instead, the media framed it as “global warming” whose main effects won’t be felt until most readers are dead. No surprise then we haven’t taken much action. Then again, I doubt the mainstream media wanted it any different. Fossil fuel providers and auto manufacturers are their two biggest advertisers. Had the campaign to reduce fossil fuel emissions been successful, those revenue streams would have dried up. So let’s instead focus on the over 8 million annual cancer deaths worldwide, most of which can be attributed to environmental pollution. Let’s focus on the lives lost to terrorism due to sticking our two cents in parts of the world where it doesn’t belong to secure oil supplies. Let’s focus on how much we spend on the military in defense of foreign oil supplies. Let’s continue to focus on the carnage automobiles cause, along with the increase in heart disease resulting from their widespread use. Let’s focus on the economic volatility which results from fossil fuel price swings. Those are all things which if fixed will positively affect those still living. If we end up mitigating global warming in the process, that will be the icing on the cake. Canceling one transatlantic flight is the third best way to limit your CO2 emissions. The second best way is to not own a car. The best way is to have one less child. The effects of climate change are with us now, in terms of the shrinking of the polar ice caps, sea-level rise, and rising ocean temperatures (leading to the increased frequency and severity of hurricanes and tropical storms). Making arguments related to climate change is the correct strategy. Anyone who is not moved by this is lost, and is as unreachable as a flat-Earther; with that type any argument you make will be futile. There’s no arguing climate change is real and man-made but I think years ago we should have instead focused on the things I said. That might have at least gotten some attention as the effects were clearly visible in the here and now. Later on, as climate science matured, it would have been reassurance we were doing the right thing. Unfortunately, the situation seems hopeless now. We’re probably past the point of no return in terms of irreversible greenhouse effect. In a matter of millenia, perhaps sooner, the Earth will become another Venus, totally inhospitable to life. The only hope I’m seeing is widespread technology to capture CO2 from the atmospheres and oceans, combined with equally massive efforts to reflect sunlight back into space. One idea I’ve had is floating trillions of golf balls in the oceans. Other ideas include putting gigantic (i.e. miles wide) shades into space. The problem has gone way beyond what can be solved just by cutting carbon emissions. I would be against any form of geoengineering. The climate system is so complex that any attempted fix is very likely to do more harm in unanticipated ways. It’s going to be an Australian rabbit scenario, writ large. The only approach worth pursuing, as inadequate as it might be, is cutting emissions by using alternative forms of energy creation. Deserts can be blanketed with solar panels and wind turbines, thereby become the most productive energy-producing lands. This would undoubtedly disrupt the desert ecosystems to some extent. But it’s not likely to have terrible effects on populated regions, unlike schemes that seek to alter the climate directly. London doesn’t need it, it’s as overpriced as New York. But I’m surprised that the rest of Europe doesn’t try to attract immigrants from the United States. Create “little Americas” where they can get by in their native language for a generation, the way immigrants from elsewhere do here, while their kids are educated in the native tongue. After all, we don’t have enough real not dead cities where you can walk and bike and take transit. And they’ve got plenty. This will also be great for tourism. Nothing more fun than calmly walking and bicycling on streets free of motor vehicles. What a pleasure! Most self-respecting people do not want Americans (or citizens of just about any other nation for that matter) invading their country. That this comes as a surprise to you, says perhaps all we need to know about you. I expect nothing but lies and hypocrisy from the mouth of Bill DeBlasio, as well as any other non-NY native grown adult who walks around talking with a NY accent because he thinks it makes him sound cool. What London is doing is awesome! And it will benefit the city economically at the same time. People love pedestrian areas – it increases foot traffic and retail sales and land values. At the same time, pedestrian areas and lower speed limits will help reduce crashes, thus reducing police and fire response costs, and reducing health costs care by having fewer traffic inflicted injuries, and reducing lost productivity at work from time off due to injury. It is a win in all ways to do what London is doing. Makes me want to move there. Unfortunately, we’re already doing geoengineering in the form of adding over 30 gigatons of CO2 to the atmosphere annually, and altering the planet’s albedo with massive deforestation. A relatively safe type of reverse geoengineering would be to remove the excess CO2 from the atmosphere, although given the fact we’ll need to remove a few trillion tons, I think the scale is beyond current engineering capabilities. People aren’t grasping the urgency of the situation. We really need to at least stop emitting CO2 completely in a 5 to 10 year time frame. In practice that means electricity generated solely from wind, solar, hydro, nuclear fission, and hopefully fusion if it comes online in time. It also means completely electrifying all transportation. Ground transportation is easy. Ships are a little harder but if fusion comes online we may have our answer. If not, battery-electric plus sail assist will probably work. Planes are the real problem. There are no answers in the near term to make air travel carbon neutral. My guess is if we decide to go carbon free air travel will be severely restricted. Recreational and most business travel will probably be banned altogether. We also need to grow a lot more food locally. Cheers to speaker of the city council Corey Johnson for speaking up again in favor of congestion pricing for NYC! I think you are forgetting the tourists who arrive, rent a car or drive one from another European country, and intend to visit both London plus other areas of Britain. The rules in London make it prohibitively expensive for some of those tourists, so they just go elsewhere. I think you are grossly overestimating the number of people who come to London and want to bring a car into the city. The rules in London make it prohibitively expensive for some of those tourists, so they just go elsewhere. Do you have any sources to back up this statement? I have no specific numbers, but just consider the numbers of visitors who fly into Heathrow and other London area airports and rent cars there. The car rental facilities are massive at Heathrow. I am also regularly in touch with the Alliance of British Drivers, the UK equivalent of the NMA. I consider their views on how the laws and rules affect residents of London and the rest of the UK to be first hand knowledge. I have also visited the UK with a rental car about 35 times since 1987. I worked at Cannon Street underground station which is 5 minutes away from the Bank station/junction in question. Some of the pavements are about 2 metres wide. in the evening rush hour its impossible to quickly walk through this area with people going everywhere. No one drives in this area. There’s hardly any street parking anyway, no multi storey parking anywhere. The area is so compacted you can walk 3 tube stations in a row in 15 minutes. “Let’s skip London entirely. There’s a mall outside Brighton with much better parking,” said not one tourist. What’s causing you to assume that all, or even most, of those people want to drive into London? The car rental facilities at Heathrow are naturally massive because plenty of people fly into Heathrow, which is one of the world’s busiest international airports, and rent cars in order to see other parts of Britain. It isn’t a large island, but there is more to it than London. I am also regularly in touch with the Alliance of British Drivers, the UK equivalent of the NMA. I consider their views on how the laws and rules affect residents of London and the rest of the UK to be first hand knowledge. So they’re as biased as you are. Got it. I have also visited the UK with a rental car about 35 times since 1987. That tells you exactly nothing about the number of people who would be affected by this change.